ரேடியன் தமிழத்தின் முன்னணி பயிற்சி நிறுவனம், இதுவரை ஆயிரத்திற்கும் மேற்பட்ட தேர்வர்களை IAS, IPS, தேர்வு துணை ஆட்சியர் (Deputy Collector), துணைக் காவல்துறை கண்காணிப்பாளர் (DSP), நகராட்சி ஆணையர், சார் பதிவாளர், உள்ளிட்ட அதிகாரிகளாகவும், குரூப்-2, குரூப்-4, வி.ஏ.ஒ., வங்கிப் பணி அரசு அலுவலர்களையும் தனது தரமான பயிற்சி மூலம் தேர்ச்சியடைய வைத்துள்ளது. My Student Mr. Rajendra Cholan BE Scored highest Ever Mark in GS TAMIL MEDIUM (443)in IAS UPSC-CSE Exam. My Student Mr. KABIB IPS, who got President medal for his Service. DEO 2017 : RADIAN Students. 1) MR. MADHANKUMAR got State-1st Rank in DEO EXAM now Disctrict Educational Officer in Salem. 2) MR. BALA DHANDAYUTHABANI State 2nd Rank now Disctrict Educational Officer in Ramanathapuram. out of Total 9 selected DEO's, 4 are RADIAN Students. GROUP-1 2017 : RADIAN Students & Deputy Collectors. 1) Miss. LAKSHMIPRIYA BE Deputy Collector. 2) Miss. SATYA BA Deputy Collector, Last year got selected as DSP. In this Batch Totally 7 RADIAN Students got Service. GROUP-2 OT 2015 : RADIAN Students. 1) MISS. 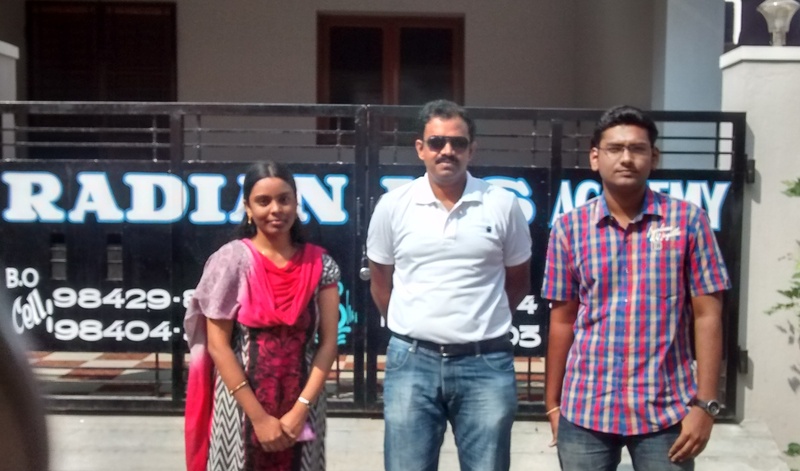 SANTHALAKSHMI G, RADIAN Student,got State-2nd Rank in GROUP-2 OT. More than 15 RADIAN Students within Top 50 Ranks. GROUP-2A 2014 : RADIAN Students. 1) MISS. CYNTHIA R.2012 BE Passed out, RADIAN ONLINE Student from MADURAI, Scored State 2nd Rank in GROUP-2A in Very First Attempt. 2) MR. RAJKUMAR.S 2013 BE Passed out RADIAN Student scored State 8th Rank in Very First Attempt. and many more state Rank holders. 7 RADIAN Students within Top 20 Ranks. GROUP-1 2013-14 : RADIAN Students & Deputy Collectors. Youngest Deputy Collectors in Very First Attempt. 1) Mrs. DIVYASHRI SATYAN BE (2012 Passed out) now Mrs. Divyashri Satyan Youngest Female Deputy Collector in this Batch. 2) Mr. RAJKUMAR BE (2012 Passed out) youngest Deputy Collector of this Batch. Another first time Student Mr.Hari (Software Engineer) got 10th Rank is also RADIAN-ONLINE Student. GROUP-1 2012-13 : RADIAN Students & Deputy Collectors. In 2013 GROUP-1, 16 Students got Deputy collector Posts..
Deputy Collectors Mr.Shadhanai Kural, Dr.P. Murugesan, Mrs.Senthil Kumari, Mr.Murugesan P, Mr.Thigarajan, Mr.Jai Beem, Miss.Fermi Vidya, Mr.Aravindan, Mr.Khaleel, Miss.Faritha Banu, Mr.Rampradheeban, Ms.Geetha, Mrs. Kavitha Raju etc. and many more GROUP-1 Officers. GROUP-1 2011-12 : 83 RADIAN Students got postings. State 5th Rank Mr.PALANIKUMAR (Our TEST Student) Reg.No-50060189. GROUP-2 2009 to 2012 : 342 RADIAN Students got postings. State 2nd Rank (MC) Mr. PARTHASARATHY, MUNICIPAL COMMISSIONER. He also Got State 3rd Rank in GROUP-1 Exam result announced in Feb.2013. State 1st Rank (VAO) Mrs. Mariselvi BE. Reg.No-90122294. She also secured 37th Rank in 2012 GROUP-4 Exam. We Take BANK Classes since 2004, Many of our Students working in RBI (officer Grade-B/SBI(PO & Clerk) & other Commercial Banks. In Last year 55% percentage of Students cleared TET exams and many scored over 100 Marks. Ex. TNPSC MADURAI to 9840400825. IAS / TNPSC / BANK / TRB / SI etc All Classes at Institute Face to Face & also Live-Stream ONLINE also. LIVE-VIDEO ONLINE Classes are similar to our Face to Face Class, you can ask Doubts LIVE, can view classes again and again. ONLINE students ask more doubts. Miss. Cynthia State 2nd Rank.